Hair Tissue Mineral Analysis (HMA or HTMA) testing 32 Heavy Metals in Australia from Toxtest and Environmental Analysis Laboratory (EAL). Toxtest and Environmental Analysis Laboratory (EAL) at Southern Cross University in Lismore, NSW, Australia, collaborate to provide hair testing of 32 heavy metals and minerals using ultra-high-sensitive equipment and innovative dynamic result presentation. Our sister site, Toxno, provides extensive exposure route and health effects information on all metals. DESCRIPTION: For the first time in Australia, human hair testing is available to the public using the absolute latest Perkin Elmer Inductively Coupled Plasma–Mass Spectrometer at Environmental Analysis Laboratories in Lismore, Australia. Instrument detection limits are at or below the single part per trillion (ppt) level for many of substances tested. Results are then presented online without any personal details - hence preserving privacy and confidentiality. Many innovative features are utilised so that individuals can get the outmost from their results. Example results are on this page. It's also a great way for children to get screened for heavy metal exposure like antimony, lead and mercury because of the non-invasive nature of the test. We are also proud to announce that animal hair testing is now available - starting with our Dog and Cat and Horse friends. Click link below to see forms and information. FROM THE LITERATURE: "Trace element analysis on hair samples has been widely used to assess wildlife and human exposure to different contaminants present in the environment or at the workplace. Several advantages were mentioned for the use of this biological material in monitoring studies, namely: (i) the less invasive character of hair collection procedures that avoid venepuncture; (ii) the stability of hair, as a biological material, which facilitates the storage and transport processes; (iii) the higher concentrations of residues usually found in hair samples, when compared to those on blood and urine, and (iv) the capacity of hair to accumulate metals during extended periods, reflecting by this way, at least 1 year of exposure." "Concern about the effects of environmental exposure to metals and metalloids on human health has driven the scientific community to find reliable tools and methods for assessing the impact of emissions of toxic metals from anthropogenic sources or naturally anomalous levels of metals in water, soil and air. There are various methods for measuring exposure to toxic substances. Biological monitoring has been extensively employed with this end in view, and blood, urine, faeces, hair and nails are the most frequently analysed biological materials to ascertain the levels of many metals. With respect to blood and urine, the metal concentrations of which decrease rapidly after exposure, hair and nails appear to be of greater value in evaluating past and ongoing exposure to high levels of metals. 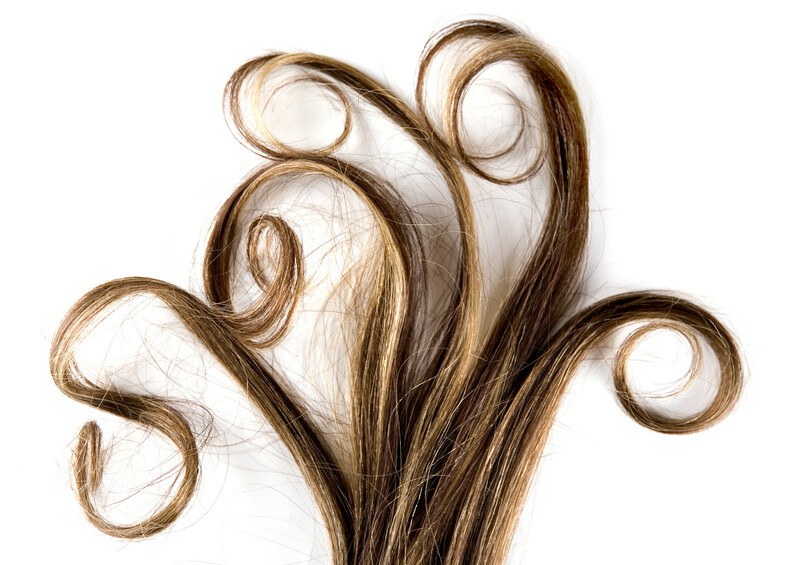 Hair has been used more frequently than nails for different purposes and in different fields of application. Medical research uses hair analysis to diagnose disease conditions and to define relationships between concentrations of metals and various diseases; forensic scientists examine hair to discover forms of poisoning due to the ingestion of abnormal doses of metals ; environmentalists try to identify areas which require attention, due to the potential exposure of resident populations to metals and also to ascertain occupational exposure to them." 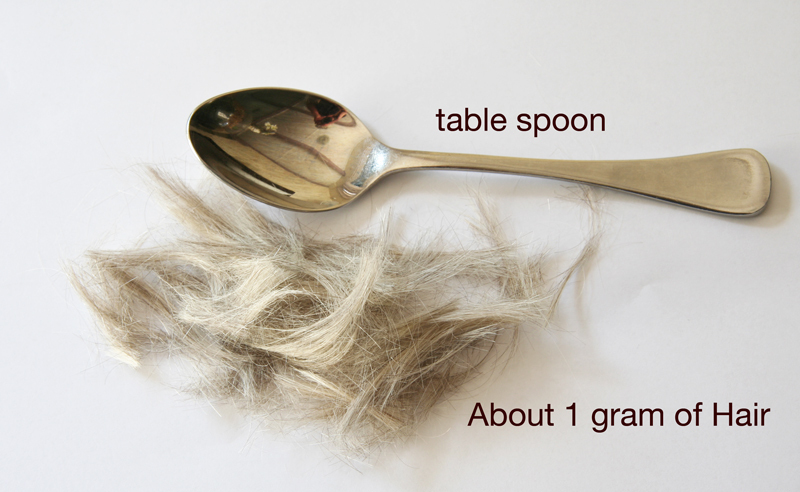 About 1 gram of hair or 2 heaped table spoons. See picture below. More details in order form. Here are some examples, revealing what results look like. Tests are being updated regularly to include new exposures and their toxic substances. And NEW tests are introduced. You can unsubscribe at any time. Metals and metalloids included in this test that are potentailly toxic to humans. These are active links that take you to a full substance profile on Toxno. From there you can also see common exposure routes for this substance along with many healthy associations and known toxic effects. Note that chromium and manganese are also human nutrients. Additional minerals also included in this test. These are also, all, human nutrients. However evidence is still being assessed as to the correlation between levels detected in hair samples and nutrient/food intake. Note that high intake or exposure to levels of nutrients that go beyond the recommended upper intake levels can also be toxic and as such have adverse health consequences.